Recently I discovered Raymond & Dorothy Moore’s books, Better Late Than Early and Home Grown Kids. These books have really revolutionized the way I think about education, school, child development… well, many things! Because they are so similar, I am going to review them together. One spends more time on the research and the other spends more time on the various years of child development and how you should deal with children at various ages, but other than that, they are nearly identical. Both books start out reviewing research that has been done on childhood development, showing that delaying education has benefits for kids. The reason is that, while they may appear bright in certain areas, they need to reach a certain level of maturity in various areas, including emotional, physical (including especially eyesight and fine motor skills), and intellectual (reasoning ability), before they are ready for the classroom and formal academics. They call reaching an appropriate level of maturity in all these areas the “Integrated Maturity Level” (IML), and they say that most children usually reach this level around the ages of 8-10. They say that starting a child before they are ready will cause them to burn out early. There is much evidence for this even in recent research (everything in their books is a few decades old—their books were published in the early 80’s). For instance, this article that discusses the benefits of delaying academic training in math, and studies have shown that delaying entrance into school by one year actually reduces inattention and hyperactivity even years later. Though not specifically mentioned in the books, the Moore Formula, as it is called, is very possibly the ideal way to homeschool. I would encourage you to check out that link, but in a nutshell, the formula is that your child’s education should include 3 things: Work, Service, and Academics. We usually think of education in terms of academics, but learning how to work and serving others develop character, and character training is even more important than academics. A Mennonite school teacher friend of ours said that he would rather graduate a student who was poor academically but had a strong moral character, than an academically bright child who had a weak moral character, and I heartily agree. One of my favorite authors said in a book on child rearing, “True education means more than taking a certain course of study. It is broad. It includes the harmonious development of all the physical powers and the mental faculties. It teaches the love and fear of God and is a preparation for the faithful discharge of life’s duties.” Child Guidance, page 293. I did not understand the principles I am learning from these books when I started homeschooling my daughter. She was 5, and she learned to read before she turned 6. But she never really did well with reading until this past summer, when she was going on 8. She has decided that she doesn’t like school, and I have backed off on how much I expect her to do. I am going to spend the rest of the school year focusing on the 3 R’s, keeping her formal work to less than two hours a day, four days per week, even though she is 9 and would traditionally be expected to do more than that. We will also explore areas of interest. Currently that means learning about horses. And letting her draw lots of them, since she loves drawing. As you can see, she is quite talented for 9 years old! I attempted twice to teach my son, who had just turned 6, to read, but now I have backed off again. He knows almost all the letter sounds now, as well as many of their names (I taught him sounds first), but he hated when I called him for school, although he did okay once we got started. So after trying twice, I backed off again, and now he is starting to sound out words on his own, even learning to get to a few (safe) places online with a little coaching, writing letters of the alphabet on his pictures, and in general getting comfortable with letters and words on his own terms. He’s going to be 7 this month, but I’m not going to push him. He has plenty of time to learn before Oregon requires him to be tested (in 3rd grade; he’ll be 10 by then), and I expect he will excel by the time he is required to sit down for the test. He is definitely bright. Anyhow, I wish I had had these books before I started homeschooling—indeed, before I had children! The principles are so simple, yet so practical. They go through each stage of a child’s development and show what you can expect and what you can teach and how to do it. Another thing the Moores teach in their books is that once a child is ready for school, he should be started in the same grade as his peers, especially if you put him into regular school. So if he is 8, he could start second or third grade, instead of starting with first grade. If he is 10, he would start fourth or fifth. They say that kids who have delayed starting formal education will catch up to their peers by the end of the school year, but that putting them in a lower grade will cause problems, because the work will be too easy. It is easier for them to learn new concepts at an older age, so the things that younger children spend a couple of years leaning, they will learn in a couple of months. This is a great advantage, because they will spend fewer years in formal school, thus drastically reducing the risk of burnout (something I experienced around the age of 16—an age that I could have finished school, I think, if I had been allowed to accelerate; but that is a whole other topic!). All in all, these books have revolutionized my perspective on education and how I conduct our homeschool. They are currently my favorite books to recommend! What experiences have you had with early schooling or delaying schooling? Recently I began reading books about homeschooling. Gifted, Raising Children Intentionally; The Brainy Bunch; The Self-Propelled Advantage; and now, The Well-Trained Mind. Each book is different. Each one espouses a different philosophy or method of education. Each one has had some influence on my thinking, some more than others. I am glad I have read them all, but I certainly will not apply myself exclusively to any of them. But this review isn’t about different views of education; it is about a specific book. The Well-Trained Mind is a book on what is known as Classical Education. I had heard of this philosophy, but didn’t really know much about it. I have been using My Father’s World, and I’m pretty happy with most of their options, so I’m not really looking to change what I do as much as just to get new ideas. I want to know how I can give my children the best education possible. This book is a rather ponderous tome. I wasn’t expecting a 2″ thick book when I reserved at the library! But I soon found that it was basically a complete 13-year curriculum, K-12, and that I didn’t need to read all of it. I don’t think I read quite half of it. I did read the first part thoroughly. I wanted to understand what a classical education was. Apparently it is what was used as the foundation of our educational system back in our great-grandparents day. Back then, students memorized lessons and really applied themselves. The things they memorized or learned early on gave them pegs upon which to hang new information later, just as learning addition and multiplication prepares a student for more advanced math, or knowing the basics of the body would be foundational to more advanced anatomy. I found the whole idea of the trivium intriguing, yet it makes sense. Why teach logic to a kindergartener? They haven’t matured enough to really reason with much logic. The grammar stage comes first. Then logic, then rhetoric. Lay the foundation, teach them to think logically about information, and the next step is teaching them to defend what they believe. That is the logic behind the trivium, and it makes perfect sense. It is unfortunate that many in our society seem to be deficient in logic. My husband and I both feel that we didn’t really develop our critical thinking skills until we were about 30. Yet those same skills can be trained into high schoolers, according to this book. It is definitely a good goal to shoot for. I really appreciated the insights on teaching math and reading for the K and 1st grade levels. This especially since I have decided to take a step back from My Father’s World Kindergarten and go back to Teach Your Child to Read in 100 Easy Lessons. I had started the book last spring with my son, then 5 years old. He seemed to be learning the sounds well, but the blending of sounds just wasn’t clicking. After 10 lessons he was getting very tired of it, so I put it away. Then I pulled out MFW K in the fall and have done 2-4 lessons a week with him. It went well until they wanted him to start spelling words by listening for the sounds in the word and then writing them. His writing skills are a bit low. He traces nicely (though he follows his own rules about what direction to trace; for now I’m not stressing over it, but emphasizing proper form when we work together), and enjoys tracing sheets of letters that I printed and laminated. If I print a Bible verse for him to trace (this site has a great program where you can make any worksheet you want), he will trace it, and he loves it. But he still has difficulty forming letters from his mind, and especially keeping them the right size for the lines available. So I pulled out 100 Easy Lessons this week and we did lesson 11. And 12, and 13. He is doing so well with it that I think I’ll continue it for now. My goal is for him to be reading simple books by summer. If we haven’t finished the 100 lessons by then, we may stop or may keep up, depending on his interest and reading level. He is sounding out words, slowly, but he is getting it. His retention of the letter sounds is very good. But back to the review. I’m not sure what to think of the way the Classical lessons are planned, with longer times per class. This would be in contrast to Charlotte Mason, who promoted 15-20 minute classes. On the other hand, there is something to be said for letting a student finish something rather than just moving on when the bell or timer rings. Time limits sometimes are useful motivators (my daughter will focus better on writing, for instance, if I set a timer), but if one gets into a project, a timer can be an annoying distraction. So I really don’t know. I think it might depend at least somewhat on the child. For now, I’m sticking with Charlotte Mason on this one, especially since MFW follows her philosophy quite a bit. But when my kids are older, we’ll see. The idea of studying history consecutively and then repeating makes sense. In some ways, MFW does that, but they start with a year of geography, and they don’t start until 2nd to 4th grade, depending on the child. Then they do the same sequence of history in high school. I’m not sure how their science matches up with the classical method, but I really don’t care. To me, science is interesting and helpful to know, but not really crucial to know in intimate detail for most careers. If I have a kid whose favorite subject is science, I’m sure I can supplement with library books if MFW isn’t deep enough to satisfy him. Speaking of library books, the classical method uses lots of books, and their recommendations for high school include a lot of reading that can fall into different categories such as Literature, History, and Science. I love the idea of a literature-rich curriculum, which MFW is. Reading a variety of things makes for balance, and when someone reads aloud, several can benefit. I liked what they said about electronics and media. They strongly discourage using videos to teach young children. They explained that watching a video requires less effort than reading the information, and this is absolutely true. If we train out children to learn in an effortless way, they will be loath to apply themselves later. I found learning relatively effortless, and I wish now that I had been challenged more. Oh that I had been allowed to skip a grade! Mom started me rather late (I was 7.5 when i started first grade) and wouldn’t let me skip; and because I had to do every single problem in the whole book, I never had time to double up and do two grades in a year. I graduated high school at 19 1/2. My husband finished at age 17. I honestly wish I had dropped out of high school at age 16. One thing they did approve of was using media to reinforce an idea already studied. Like watching the movie after reading the book instead of before, or watching a documentary of Lewis and Clark after spending a week reading about them. I like this idea immensely. We read about Harriet Tubman recently, and after we had finished the four chapters about her life, we watched a video about her. I’m definitely going to be more limiting and intentional in my use of visual media than I was before. They discussed the idea that many today have of letting kids express themselves, and how many feel that making a child learn by the rules will stifle creativity. The book says that this is wrong, because in reality we need to give the child the tools with which to be creative. It reminded me of an art class my daughter took. 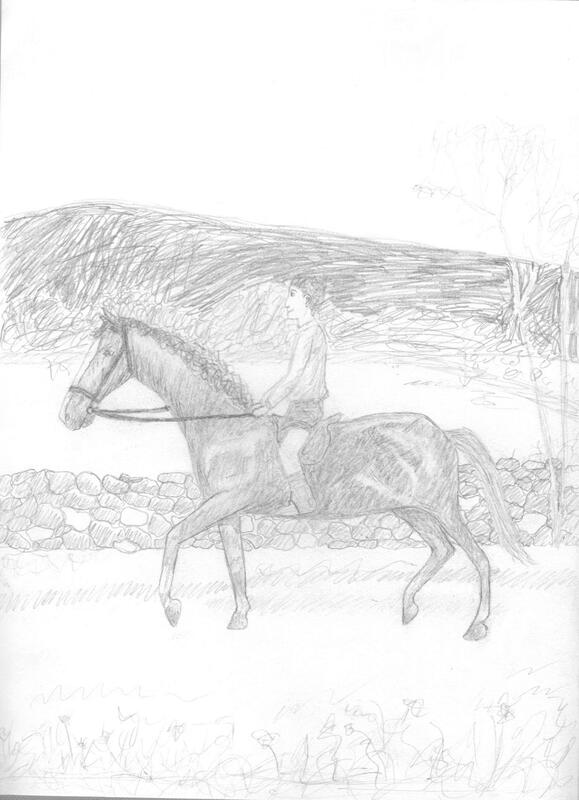 It was called Process Painting, and she was encouraged to look within for the ability to draw and paint what she wanted, as if she possessed all the ability within naturally. No instruction was given. So basically I paid $75 for her to spend 6 hours painting in someone else’s studio with their paints and brushes. She learned nothing except how to clean the brushes between colors (which she knew anyway). I felt like it was a waste of money. I thought that if she could have been taught some kind of technique, she could have expressed herself better. Process painting may be helpful for therapeutic purposes, but for the elementary student, a class that teaches techniques would be much more valuable. So my gut reaction to that experience was validated by the book! One thing I did not agree with was their choice of literature. It seemed that they encouraged myths and fairy tales and fiction without limit. I mean, there is nothing wrong with being familiar with the story of Achilles or Hercules, and I know MFW will cover some of those things when we study the era of Greece, but letting a second grader read those stories as entertainment? I don’t think I want my kids to know Greek mythology just yet, and especially to read it for fun. They need a solid foundation in the Bible. And while I am not exactly opposed to all fiction across the board, I feel that it is important to guard what we read, especially for pleasure. What we read affects us; it influences and changes us. If one reads trashy romance novels, for instance, one might become dissatisfied with her singleness or marriage. Reading that makes one lose a taste for the sacred is questionable at best, and deadly at worst. Exciting stories dull the taste for more important things. I might read the occasional Biblical fiction (a book wrapped around a Bible character), but first I only read one here and there, maybe a couple a year, and I allow them only because I find the insight into the culture of the times helpful. But I don’t want to fill my children’s minds with “great literature” so much as I want to fill them with truth that will affect their eternal life. I believe that there is no book so calculated to strengthen mental vigor as the Bible. I don’t care if my children ever read Pride and Prejudice. But I want them to read The Desire of Ages and the other books in that series. Latin is part of a classical education. They gave some compelling reasons for learning it. I see the logic behind learning it, and I am inclined to want to try it. Knowing Spanish rather fluently and comprehending a good bit of French and Italian, I think it would be easy to pick up. At the very least, I could learn to read ancient Latin literature, or comprehend the Douay Bible. I don’t think Latin would help a student speak a Latin-based language easier–each language has it’s own system of pronunciation rules, some quite different from each other (Spanish and French, for instance). Yet if one knew Latin, he could comprehend a good written portion (probably more than 50%) of almost any Latin language without learning the language at all. This would accelerate learning of the language. I base my saying of this not so much on the book, but on my own experience learning Spanish. Comprehension increased my learning. Words that were similar to English (culpable–which is pronounced differently from the English word but written identically–imaginación, mansión, cañon, etc) were easy to learn. I read a book about Creation vs Evolution when I had been speaking Spanish for less than two years and found it the easiest book ever, because the technical words were so similar to English technical vocabulary! So I see the logic of learning Latin, and may try to find a curriculum to start in 4th or 5th grade. But I need to work on some self-discipline in my kids first. I felt that the book bowed a little too much to the schools when it discussed dealing with local schools. It recommended reporting your intent to homeschool to the local school district regardless of the laws of the state, and recommended giving more information than many states require. The problem with this, in my mind, is that we are not given the right to homeschool by the state, but by God. If the law requires it, I will register or supply a portfolio or test my child yearly. But if it does not, I won’t. I do not need to ask permission to homeschool my child. I do not need to give them more information than is required by law. In Oregon, testing is only required in certain grades, and though I might do a practice test each year to prepare for the actual test in those grades, I will not do a formal test yearly. Also, one need only report the grade if the school district requests it. I will not volunteer information that is not requested or required by law. I wish an HSLDA lawyer could help them rewrite that chapter of the book for the next edition. Overall, I think it is a great resource, and I just might buy it for my library someday. For sure if I run across one at the thrift store, I would absolutely buy it! The end-of-chapter lists of resources alone are worth the cost of the book. But will I adopt the Classical method of education? Probably not. I’m much more Charlotte Mason inspired than classical. I like My Father’s World. It simplifies my life. I can skip things, change them, supplement them, but it provides the foundation upon which to build. I don’t see us switching to something like Classical Conversations or anything like that. But I do appreciate a greater understanding of the principles of a Classical education, and I feel that my time reading the book was well-spent. That’s probably not the best title, but it’s the best I can think of at the moment. At least it’s better than “Things I’m Doing With My Second Grader to Help Her Learn Math and Make Sure She Has Mastered It”! So let me tell you about my little second grader. I say she’s second grade because we have to have a grade level according to the state of Oregon. I informed the local school district of our intent to homeschool back in August and stated that she was in second grade, which is mostly true. However, most of our school work is not based on grade level. For instance, we are using Spelling Power, a mastery based program that allows children to go as fast as they can, or as slow as they need to. She tested into Level B, and in two weeks she has gotten half way through the 4th group of words, which is the equivalent of almost 4 weeks in a regular spelling book. At the rate she’s going, she’ll be in Level C before the end of the school year. But the levels are not technically grade levels. So I can’t base her grade on the work she’s doing. I basically base it on how many years she’s been in school at this point–especially since the State of Oregon is happy with that. She does understand the problems, but she thinks differently than I do. Sometimes she will get it, and other times it’s like she doesn’t want to, or something. That, and it seems to be so hard for her to memorize math facts. We have tried several things. Quarter Mile Math is a great program, but it is frustrating for her when she can’t better her previous scores, and it hasn’t helped her learn the facts any better. Too much pressure, and she doesn’t do well under pressure. Xtra Math helps, but again, part of it is timed, and she doesn’t like the pressure. We do it every week or two to track progress, but I type while she answers aloud, to eliminate the slowness of finding the keys. Math Trainer seems to be the best program so far, and I try to have her do that often. She does 5 minutes a day, and it doesn’t pressure her with a time limit per problem (unless you set it up to do that, which we don’t). It corrects wrong answers and has her repeat it again. It’s not fancy or flashy, but she hasn’t complained about it, so we use it frequently. Then someone on Practical Homeschooling’s Facebook page recommended RightStart Math. I was intrigued. I had always though that an abacus would be helpful as a manipulative for learning math, but I had been waiting to find one at a thrift store. But when I looked over how their abacus works and tried the virtual one, I was realized that this was not just a regular abacus. I brought my daughter over and showed her how it worked, and she loved it. It made sense to her! I asked her if she wanted me to get her a real one that she could touch, and she got very excited. So I bought one on Amazon. It has revolutionized our math time. I can help her understand the concept and let her do the work on her own. She totally gets how it works, and she can do it quickly, and recently she did some math in her head (subtracting something like 58-13), so I know it’s working! I hope it holds up, because I intend to use it for the rest of my kids. I just wish I hadn’t known about this one sooner! I’ve been reading this book called The Self-Propelled Advantage, and the author makes a case for having students learn to mastery, not just enough to pass. One of the big advantages of this is that the student will have fewer gaps in their understand if they master everything. It also teaches them to excel and keeps them from feeling like a failure. If they get a D on a test, for instance, in regular school they would be passed on, but with a mastery approach, if they get a D, they study their weak areas and then take the test again, until they get an A. I think there is something to this. Now, I don’t test much. There is a daily spelling test of the 5 words my daughter studied the day before, as well as new words, with the Spelling Power method, but that is part of the method, and the test isn’t graded. Any words she misses are the words she studies that day. With math, I know if she knows the material, more or less, and I know when to take a break and focus on something else. But sometimes it’s I’m not always sure. So what I’ve decided to do with her math is have her take the placement test next week, after she finishes the reviews. If she gets an A, I will give her a short break from Singapore Math (anywhere from 1 day to a week) and let her spend some time doing Khan Academy math. Then I’ll give her the 2A placement test. I know she won’t get an A on that, but it will tell me what she knows and what she doesn’t. Anything she knows well I will skip, because why study something you already know well? Then when the book is done, I’ll give her the same test again. If she gets an A, we move on. If she gets less than A, we go back and study the missed areas, using other resources (like Khan Academy). I think this method will give her enough testing experience to avoid test fright when she has to take the 3rd grade state-mandated test, and it will help me tremendously to know where to focus my attention during the next few months. For now, I’m going to let her use the abacus, but I suspect that eventually she’ll get an “abacus in her head” and then she won’t need to use it anymore. She is more right-brained (which is where the RightStart math program gets its name, I think–it’s designed for right-brained students), and being able to visualize the math helps her so much. I visualize numbers after a fashion in my mind, and I love manipulating them in my mind, which is why I like puzzles like Killer Sudoku. Singapore Math teaches that same kind of mental manipulation, but kids need something concrete to develop the abstract, which is where manipulatives come in. Some kids develop that abstract understanding faster than others, and my daughter is a bit slower. My hope is that by the end of Level 2B, she won’t need the abacus anymore. We’ll see. So that’s my plan for math. If you homeschool, what math program are you using, and how are you helping your child master the concepts? I thought it might be nice to share what I’ve been reading. I’m going to try to do this every month; we’ll see how it goes. If you are a homeschooler or are thinking about homeschooling, then you just might find this month’s list helpful. I picked up Unit Studies Made Easy from the library. At almost an inch thick, this book looks overwhelming, but 1) it is really several books in one, and there is a bit of redundancy, and 2) the parts about how to do unit studies are shorter, and most of the book is filled with examples that the casual reader won’t read in detail. It would make a great resource to have, but ultimately it teaches you how to do your own unit studies, and gives you a picture of a philosophy of education that is very different from traditional school, yet much closer to what I believe God intended for children to have. If you live in a state that requires a certain number of hours of school per year, this is a great book; it gives you creative ways to record educational activities. Helping with cooking or cleaning (aka, chores) can be labeled as Home Economics or some other fancy label. Looking up things on Google could be Research 101, or whatever. Listening to Mom read stories could be Listening Comprehension. To be sure, education is more than just textbooks and workbooks! I definitely recommend this book, and may end up getting my own copy someday. It’s got some great resources in it! Gifted: Raising Children Intentionally by Chris Davis is an excellent book. Not too long, either. I bought the Kindle version, and I don’t regret buying it. I might regret not getting a hard copy, but I wrote the library and suggested they get it, so we’ll see. Chris Davis was a homeschool father back when homeschooling was illegal in most states, a pioneer in the movement. He believes that children are not empty slates to be filled with information, but rather that they have been given gifts by God to glorify Him, and that it is our job to help them figure out what those gifts are and to develop them to the fullest. He takes to heart the words of John Gatto when he says something like, “Find out what public schools are doing and do something else,” and he goes into some detail on how to do “something else.” This book was so formative in many ways of my philosophy, or perhaps refining it, that I loaned it via Kindle loan to my husband, in the hopes that he will read at least some of it so we can discuss it. The Brainy Bunch by Kip and Mona Lisa Harding is the story of how they got 7 of their 10 children into college by age 12. The book is more of their story than a how-to manual, but it does have some how-we-did-it in there between story lines. I found the book a bit disorganized, more like it had been transcribed from a series of lectures, rather than written, which makes me think my husband would probably never read it (he hasn’t the patience for certain kinds of books like that). I might try sharing with him some of the ideas. However, I am not quite sure what to make of the book. I can see how getting their kids in college was helpful for them. Pretty much all their kids were doing high school level work by age 10, especially math, and even if they took high-school level courses to start with, they were able to avoid the drama and, in some cases, boredom, of high school. College classes are not every day, so the kids weren’t in class every day, and they learned to manage their time like adults instead of having someone else (aka, school and teacher) manage it for them. Their classroom associates were mature adults instead of immature teens. The goal of developing their passions kept them motivated. But on the other hand, they way this family works is to start the kids reading at age 4 or 5, and accelerating their math so that by age 8 or 9 they are doing pre-algebra. I’m not sure that’s possible for everyone. It has worked for them, but in their case, the first child was good at math, with her dad teaching her some calculus problems he was studying when she was 4, and she set the bar high for her siblings by passing the ACT or SAT (I forget which) at age 12 and starting college. Pretty soon everyone wanted to be in college by age 12 (one kid made it by age 10). They advanced them in math quickly and encouraged reading. My oldest, on the other hand, is still reading at the 1st grade level in 2nd grade (she doesn’t enjoy reading, although she is improving), and she is having a hard time learning math facts and even relatively basic concepts. I’m still trying to figure out how to teach her in a way that makes sense to her (because math was my strong suit and came easily for me, it’s hard for me to think like someone for whom math was not easy). Not that I want her in college at age 12, but still, I have some questions about the concept of the book. Nonetheless, it made interesting reading, and I polished it off in about 3 days. That’s all for this month. I just requested the book The Self Propelled Advantage from the library. I read the Kindle sample, and now I can’t wait to get the book. But I bought two Kindle books already this month, and I’m not about to buy another one right now, so since the library has this one, I’m going to be patient and read the hard copy when it comes. I also want to read Little Kids Big Money, since my daughter seems motivated by money, and coins are the only math manipulatives she will use right now, other than her fingers, so i am determined that she will learn to count it well, and may as well learn more about managing it. The other book I want to read is The Pursuit of God by A. W. Tozer. I want to read at least one devotional/spiritual book each month (perhaps continued from the last month if it’s long). Maybe next year I will share the full list of Kindle books I plan to read in 2015, and then share each month what I actually read, which will include library books and maybe (gasp) even a few from my own library. Pardon the big gap in my blog. It’s taken me a while to decide to write. I can’t promise to write regularly, but I have a need right now to write, so here goes. Please note that there are affiliate links within this post. Any purchases made from these links will go toward the maintenance of this blog. Regrets can be debilitating, but they can also be freeing. I recently realized that I regret something in my life in a very different way from how I used to regret it. I guess you could say I now know what I would have done differently if I had known what I know now, and it is different from what I would have done if I had chosen not to do the thing I regret. Let me explain. Or rather, let me shock you, and then explain. I wish I had dropped out of high school at age 15 or 16. There. Did I shock you? I meant that, every word of it. I wish I had dropped out of highschool. I really do. That’s what I would do differently if I knew what I know now. What I did back then was cheat. Maybe I’ve written about this before, but I can’t remember. All I know is that I was so tired of boring textbooks that I decided I would give myself time to do things I enjoyed by not studying things I didn’t care to know, and cheat to pass the tests so that I could get on with my life. I regret cheating a lot. I’m not ashamed of it anymore–I mean, it was a long time ago. But I wish I had done things differently. But I don’t wish I had studied harder and been honest on the tests. What I wish is that I had dropped out of high school and just gotten my GED (which probably would have taken only minimal study, mostly for math, which I enjoyed anyway, so studying for it would have been a pleasure). While I was working on that, I would have started fundraising to go as a student missionary. Of course, this is in the ideal world where my mom would have let me go as a student missionary. She never would let me go, and the only reason I got to go to Peru for 2 weeks was that I had already left home and she had no part in the decision. But if I could have, I would have gone as a student missionary to some foreign country for a year or so and done something there. When I got back, I would have probably gotten a job and raised money to go to some Bible Worker training school. When I was done with that, I would have been hired as a Bible worker, and worked at that for a while. At least, that is what I wish I had done. Instead of going to Bible Worker training school, I might have gone to a Christian College and done study there. Maybe I would have been a student at the college where I met my husband instead of the secretary. What I do know is, if I had dropped out of high school, my teen years would not have been spent studying (or avoiding studying) things I would never remember or need anyway. They would have been spent having rich life experiences, growing in character instead of deforming my character by taking the easy way out (cheating on tests). I would be a very different person today if I had dropped out of high school and pursued my dreams, the dreams that the Lord had placed in my heart. Of course, I can’t spend too much time on regrets. I can’t change the past. I can change the future, however, and the future of my children. I will never make my kids sit for several hours a day doing dry, boring school work. Not at all. I will make sure they have the opportunities they need to succeed, and that might mean real life experiences instead of textbooks and workbooks. I hated history in high school, but when I think of the textbooks I had, I can’t blame myself for hating it. History from living books (books written by people who experienced the events) is so much more interesting! So is learning history on location (like I did when I went to Italy–if only that trip could have counted for a semester of history!). What made me realize all this? What was it that made me wish I had dropped out of high school and moved on with my life? It was a book called Gifted: Raising Children Intentionally, by Chris Davis. Not that the author promotes dropping out of high school! But he discussed a group of honor students who he caught taking down the answers to a math test (he was the substitute teacher), and when he asked them why they thought it was okay, they said, “Hey, we’re not going to use this stuff in our future. She’s good at math, so she’s helping us out. We study all the time; we don’t have a life. Math isn’t important for most of us. But good grades are important. So we do what we have to.” What he proposes is giving children the chance to do things that are important, to learn what will help them in the path they see themselves going. I have three children and might have more someday. So how can I take what I know now that I wish I had known and apply it to their futures? First, I will not force them to do anything that they find boring–not now, not ever. There will be time enough for that in college if they decide to go. Now, I will clarify, I am referring to schoolwork, not chores! But if a child finds it boring to color the pictures that match the sound, then why not just circle them and move on? Or even just point to them? If they want to color them because they enjoy coloring, then color away. But if they don’t like coloring, why force them to? If I’m reading a book and my daughter says, “Mom, that’s boring,” I’ll drop the book and either skip the material or find another way of presenting it. Now, I don’t mean I won’t teach persistence. Once a child starts a project, I will encourage them to finish it under most circumstances. But to make them do something they find boring is just going to stifle creativity and love of learning. There is another book that I am reading now that has a similar message to Gifted, and that is The Brainy Bunch by the Harding family. You might have heard of the family that had several kids in college by age 12, and the only ones who hadn’t started college by 12 were still under the age of 12. The book talks about what they did. They focused on the kids’ strengths, in much more detail than normal school would allow. They didn’t do every problem in the workbook, nor every page either. They made sure their children mastered concepts before moving on, but if the kid was proficient in something, they skipped the review. Now, I don’t think every kid should go to college, but these kids had dreams that required a college education, so they got it. They missed all the drama of high school, as well, and by the time most kids are trying to figure out what they want to study in college, they had already had a degree and some work experience to go with it. Right now my daughter wants to be “a nurse and an artist.” She draws and colors incessantly, and she has skills at the age of 8 that I didn’t develop until years later. I’m still better at drawing than she is, but give her a few years, and I am sure she will pass me up. About the nurse part, I’m not so sure. She says she wants to be a nurse, but she almost never plays nurse or asks about what nurses do or anything. I think maybe we need to go on a field trip to a hospital and let her see firsthand. In the mean time, she also has an eye for decorating, and I let her go help a friend of ours who decorates part time. That’s a skill she could turn into a career, and she loves it. My first son is into electronics. And Legos. He doesn’t have any yet, but shhhh, he’s getting some for his birthday next month. For now, he plays with duplos, and really gets upset when his toddler brother messes up his creations. But the electronics… every time I read a story book, he wants to know if they had electricity back then. It got to the point where I told him to listen to the story and look at the pictures and tell me at the end of the book. So we look for clues in the story to determine if they had electricity or not. For Christmas, he is getting a screwdriver. With two sizes each of straight and philips bits, he will be able to take apart most things. Then he can have my defunct waffle iron and popcorn popper, as well as any broken electronics I can scare up at the local thrift store for free, to take apart and study and attempt to fix if he wants. That should keep him busy for a while! And who knows? Maybe he will go into electronics or engineering or something? The toddler, at age 2, is still too young to figure out what he might be, but he is already trying to learn the alphabet (he knows the letter S by sight and sound, and he loves “my wetter A”. I won’t be the least bit surprised if he teaches himself to read by the age of 4. He also has a larger-than-average vocabulary for his age, and he talks incessantly. For now, I try to keep him out of trouble–no easy task, to be sure! All I know is, I am happy being a mom. Sometimes, I will admit, I have not always been so happy. Sometimes almost depressed. Mostly as a result of intemperance. But I realize that I need to have some purpose beyond just caring for the kids. I have decided to take voice lessons and to start singing more regularly at church, and offering to sing at other churches. And speak. I got to teach a Sabbath School class last week, and I enjoyed it so much! I wanted to preach when I was young, and I had some ability, but my mom wouldn’t let me. Now, though, I am going to let go of the inhibitions that were imposed on me by others. I cannot define my life’s purpose by what my mom thought I should or shouldn’t do. I need to do what God wants me to do, with my husband’s blessing. I have his blessing, so I will move forward. And turn those regrets into something beautiful. Today was day two for Gislaine’s trip into first grade. Of course, we are spending time reviewing things she learned in Kindergarten. I would skip the review, since she only finished Kindergarten last Friday, but she enjoys writing and needs the practice writing letters. And with spelling, apparently, as you will see in a moment. After we finished the lesson for the day, I went to take a nap before I had to start lunch. 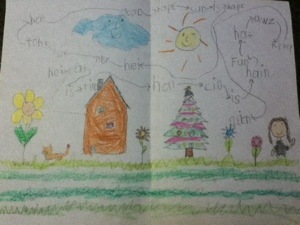 While I napped, she drew a picture and wrote a story to go with it. Keep in mind that she has only learned one sound per letter so far, and only short vowel sounds. She also knows the word “the” by sight, but has never had to learn to write it yet. The cat is tired. The kid is having fun. The hours went here. The sun is hot. The Glad (name of cloud) happy. Sun is happy. Done. I did casually point out her numerous and creative spellings for the word “the”, and just as casually mentioned the correct spelling. But other than that, I didn’t criticize the work at all. I think she was very creative to write backwards when the words were going from right to left, and I loved the arrows telling the reader which word to read next. I wouldn’t be surprised if she begins writing more. I expect her spelling will improve. She can write 2 and 3 letter words that I dictate if they have a short vowel in them, most without any prompting at all. She is bright and creative. I want to foster that. This is going to be a great school year! Today the kids found a yellow caterpillar that has the body of a woolly bear (you know, those red and black banded fuzzy caterpillars). Ever since we studied the letter B for Butterfly and watched caterpillars metamorphose into butterflies (they came with Gislaine’s kindergarten kit), we have wanted to use the butterfly house again. But we were not able to identify any caterpillars until today, and I felt identification was important so that we would know what to feed it. 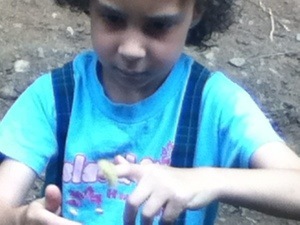 A quick search informed us that the caterpillar is called a Yellow Bear and will turn into a white moth. It eats all kinds of greens, including grass and clover, which is quite abundant around here, so it was a good choice. Now we have it in a glass jar with a sprouting lid on top. Gislaine has promised to give it fresh greens daily, so we’ll see what happens. 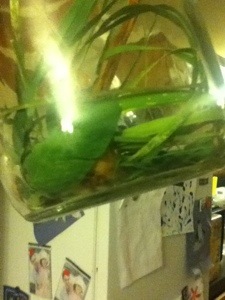 Can you see him hiding there in the jar under the leaves? He’s gone to sleep for the night. I’ve been absent from this blog for a while. Just got a new (to me) iPod with a more up-to-date OS, so I’m going to be able to post now and again in my spare time. Including pictures, since it has a camera! I discovered this post sitting pending, so here it is. It’s a bit old, but still good. Enjoy! Have you ever had a child use a simple growing ache to try to excuse themselves from some aspect of life? I have! My daughter was complaining that her leg was sore, but I knew it wasn’t sore muscles. I had sore muscles, but I was carrying on without using them as any kind of excuse. She, on the other hand, was limping around, declaring that she couldn’t get up to get a bowl or cereal to put in it. So Daddy, recalling something he had heard on a child training CD, found some apple cider vinegar, mixed a spoonful with some chili powder, and offered her a spoonful, promising that it would cure her leg. She held it in her mouth until she couldn’t stand the taste anymore, then ran to the bathroom to spit it out (since she couldn’t bring herself to swallow it). Daddy called after her that if her leg kept hurting that she should come back for another dose. Notice that she ran! When she returned, the limp was gone. It was a miracle cure! I will admit that I had a hard time keeping a straight face throughout the ordeal. I just stood at the stove and flipped Sweet Potato Pancakes and tried my best not to laugh at her! The great thing about this medicine is that it has more than one recipe. You can use any nasty-tasting healthy ingredients you have available. Garlic is a good choice, as would radish juice or castor oil or whatever you have on hand. As the guy on the CD said, three doses are guaranteed to cure all present and future pains, as well as prevent the development of future hypochondriacs! While many adults seem to have a hard time memorizing anything, children usually find it easy to memorize. And most people find that the things they memorized as children stick with them for life. So what better time to fill their heart with God’s Word than when they are children? As a teenager, I began to memorize copious amounts of Scripture. I not only memorized single verses galore, but I also memorized whole chapters and even several books of the Bible, such as James, Romans, and Galatians (among others). Life got in the way, and although I made some stabs at memorizing several times during my 20’s, it has been hard to really get back into it. But then I was challenged by a blog I was reading to start my daughter memorizing again. I have watched her learn a Bible verse in 3 days. She has been memorizing little thoughts for Kindergarten, one every unit, and she can recite the last 10 of them in order. We are still working on Unit 11. Kimberly at Raising Olives has 11 children, if I’m counting right, and she has them all work on Bible memory. It goes along with her desire to have her children think Biblically about life, and I am realizing that I want that for my children too. I don’t want to be content to have them memorize a memory verse for Sabbath school and then forget it later. I want them to really have God’s Word in their heart, so that they will understand why we do what we do, why we live the way we live, why we make the choices we make. So Kimberly’s post about their Bible memorization system really inspired me. However, I’m a high-tech, thrifty kind of gal. I don’t like spending money if I don’t have to, and I love saving paper when I can. Kimberly’s method involves making cards for all the Bible verses, as well as a slightly complicated filing system (that makes sense, but it does involve about 2 packs of dividers). I don’t have the dividers, and I don’t want to go out and buy them. I want to implement the system right now. Enter Errands. Errands is a to-do app for mobile devices. I’ve been using it for several years to help me remember all the things I need to do but would otherwise forget, and I love it. I consider it the ultimate to-do app ever, and it’s free! It doesn’t get better than that! Someday I’ll write a post about how I use it and all it’s wonderful features, but for now, let me tell you how I have set it up to use for Gislaine’s Bible memory. First of all, Errands allows you to make different folders, or lists, so I made a folder just for Bible memory. This way it won’t get mixed up with things like taking my vitamins and washing windows. *smile* Then I made tasks with the references of the verses my daughter either had memorized or was working on. The app doesn’t have a Bible picture, so I chose the church. I can change that later. Anyhow, here you can see the verses she is reviewing, like Matthew 24:44, and the new verse we started learning today, John 6:35 (I marked it done after taking the screen shot). The neat thing about this app is that it allows tasks to repeat. This is nice, because I can, for instance, set it to remind me to mop my floors every Thursday or wash my windows every 6 months. So this is also perfect for the Bible memory system. We will work on any verse that shows up in Today (and overdue, if we missed a day). I put “NEW” in the description section to indicate verses we are actively working on–these we will repeat 2-3 times to learn, instead of just once to review. I have set the repeat frequency to daily (or every weekday for reviewing; the repeat function is amazing and extremely flexible), and once I’ve decided that Gislaine has learned a verse well enough, I’ll change the repeat frequency. To keep the list of verses to review down to a manageable size, I can specify an end repeat date, say 6 months or a year or whatever, and it will mark the verse as completed. It will then appear in the recycle box (the little recycle triangle next to the plus at the top), and I can recycle it from time to time for review. I don’t have to do that with all verses (John 3:16, anyone? ), but for verses I might not know well, I can paste in the whole verse. For verses I know well but don’t remember by reference (I mean, how can one recognize a couple thousand verses by reference only? ), I can just enter the first few words, either here on in the description line. I can even set up verses that I want her to memorize in the future. I put no due date, so it shows up in a section called “No Due Date” at the bottom of the list. I do, however, set the repeat frequency to every day, so that once we have clicked on it, it will repeat the next day and the next and so on. This way I can input a bunch of verses all at once, or add a verse whenever I think of it. I’m thinking that I will add several verses from the Child Training Bible on specific topics that will address character issues we are dealing with. What better way to remind a child about a character flaw than to point them to God’s Word? I believe this will make the memorizing even more powerful. So essentially, my method is exactly like Kimberly’s, except that it’s paperless, and I can take it anywhere, even reviewing in doctor’s offices and such. I might not always do it this way. Maybe once my daughter is older, I will encourage her to make her own card file system. I don’t expect I will get her an iPod for a long time, though if I ever do (or if she buys one someday with her own money), I could help her set up her own Bible memory system with it. Just in case you are wondering, this is not the method I use for myself. 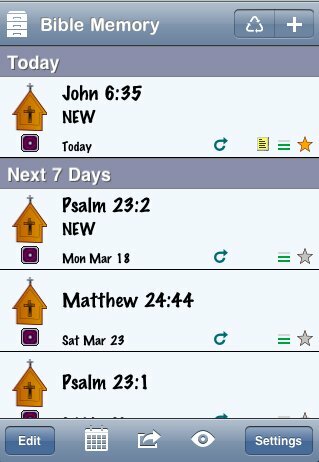 I have a program called Bible Verses that allows me to add my own verses and even record audio (my favorite method of memorizing is to hear something–it’s the way I memorize best). It doesn’t have a fancy review system, but that’s okay. I don’t need it. And I don’t work on it every day. Often it’s the last thing I do before closing my eyes at night. It’s free, and it works just fine for me. So what about you? Have you done any memorizing? Do you encourage your children to memorize? Do you have a system? Please share! This post is linked with the Works for Me Wednesday and Modest Monday blog carnivals.